6 - Weave in all loose ends, make sure ends are rolled and place on your teapot spout. 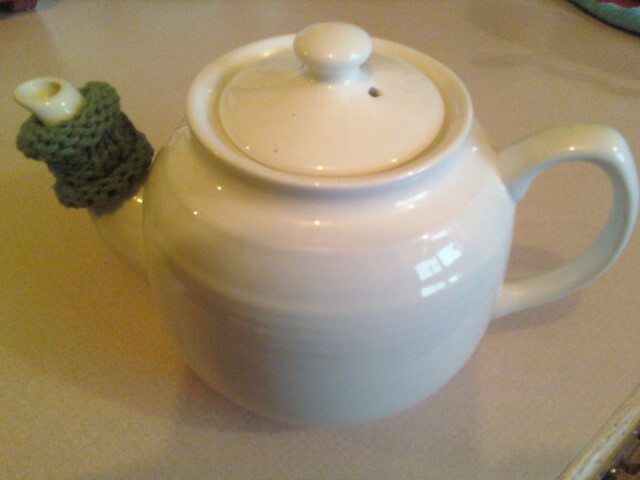 The perfect thing for those of us who bought teapots that were lovely and not necessarily well designed. I'm making one tonight! I was delighted to find this on my computer this morning. Will start one right away. Such a simple, perfect idea! Thank you for sharing your creativity. How did you know what I needed! What a great idea! Thank you! That's just brilliant! I'm saving the pattern to make at least four: one for my daughter's tea set, one for my nieces', and two for my two teapots. If my brother's baby is a girl, she'll get a tea set with one of these, too! I'll put the picture on Ravelry under 'siffknit.' Thanks for the pattern! I have plenty of teapots that have, er, issues with dribbling? Haven't liked any of the commercial drip catchers I have seen but I'll try this one on for size! 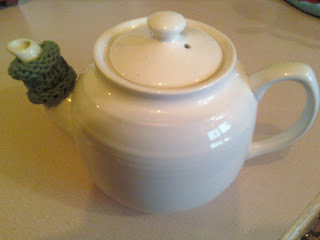 Speaking of size, is there an adjustment in stitch count for the little personal size teapots? Hi, Caryn S - thanks so much for you comment ..... a few things that will adjust the size of the drip catcher is (1) the size of your needle .... if you want to make it smaller, go down a size or two with your needles, (2) use thinner yarn - this will help when you use smaller needles .... the yarn I used is worsted weight, or close to it, but there is thinner cotton yarn that you could use, (3) decrease the amount of stitches you are working - if you wanted to keep the k2 p2 pattern in the middle then you would have to cast on, at least, 2 less stitches (just make sure you don't start each rib row with a k2, if you decrease just 2 stitches .... you would alternate with starting the rows with either a k2 or a p2 - in order to keep the pattern, or you'll end up with double seed stitch - which is very pretty, lol), (4) decrease the amount of rows you work - so, instead of 6 rows of stockinette, 4 rows of ribbing, 6 rows of stockinette .... you could maybe do 4 rows of stockinette & 3 rows of ribbing and see how that works for your tea pot.